Expand the memory of your Smartphone¹ or Tablet¹ easily with the Toshiba Mini 360 Duo. 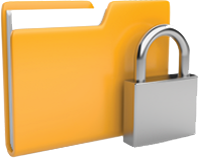 Now, you can easily backup, store or transfer your favourite movies, music, photos and documents from your mobile devices as well as your PC. Features a micro USB2.0 and a regular USB3.0 connector, you can now have a flash drive to work with both your PC and mobile device. The Toshiba Mini 360 Duo will work with most Smartphones and tablet that support the USB On-The-Go (OTG) standard, as well as most Windows based PC and Mac. No Internet connection, power supply or mobile device application is required for the Toshiba Mini 360 Duo to work. Simply plug it into your PC, tablet or Smartphone and you are ready to go! For usage with your Smartphone or tablet, simply swivel the protective cover and pop out the micro USB connector. A built-in hook on the Toshiba Mini 360 Duo lets you conveniently attach it to your keychain or mobile phone. 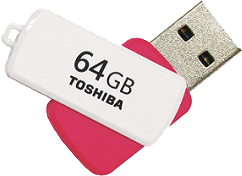 The Toshiba Mini 360 Duo Flash Drive is available in four cool colours and is available in 8GB, 16GB, 32GB and 64GB capacities. Preloaded with password protection software², the Toshiba Mini 360 Duo keeps your important and private data in a protected partition where it will be safe prying eyes. This feature works on Windows PC only. 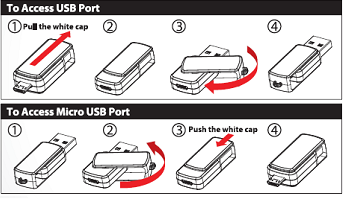 ¹ Smartphones or Tablet must support USB On-The-Go (OTG) feature. ² Applicable for PC with Windows Vista and above only.